Salzburg is a somewhat rainy place. Castles and Palaces offer an often welcome indoor alternative to sightseeing in the rain. Note that we have another article dealing with the most important Palaces in Salzburg; and another list with essentially all castels and palaces in the province of Salzburg. 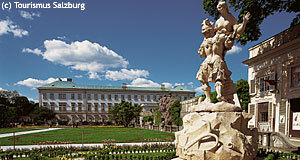 This directory is a list with palaces, castles and chateaux in the city of Salzburg. It should provide an overview to international visitors. If we have missed out on any, let us know and we will include them.